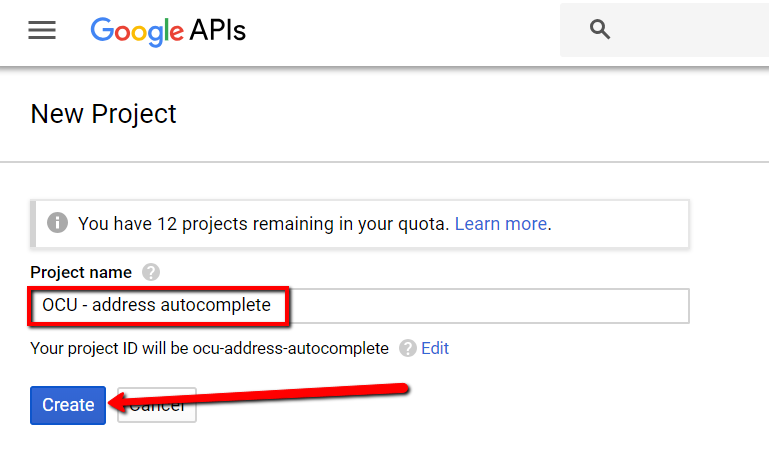 Follow these steps to create your Google API key to enable Address Autocomplete on your OCU checkout! 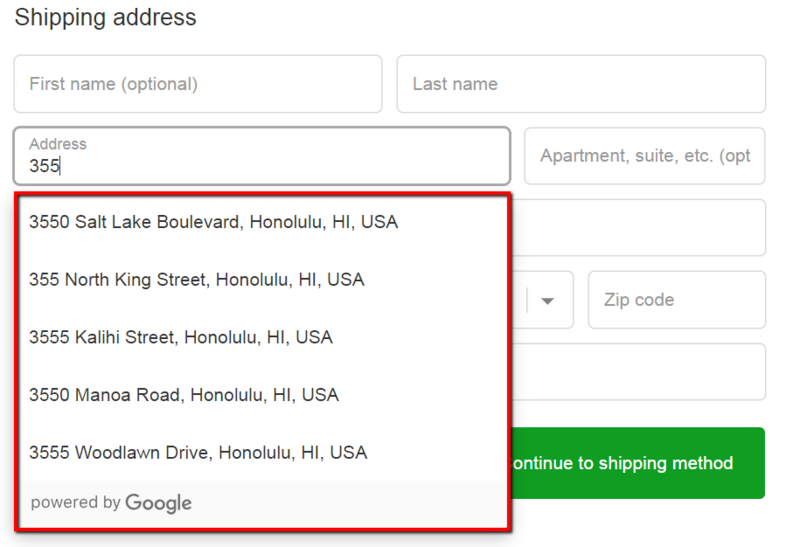 To help decrease checkout abandonment and increase purchase conversion rates, OneClickUpsell checkout supports checkout address autocomplete through the Google Places API. 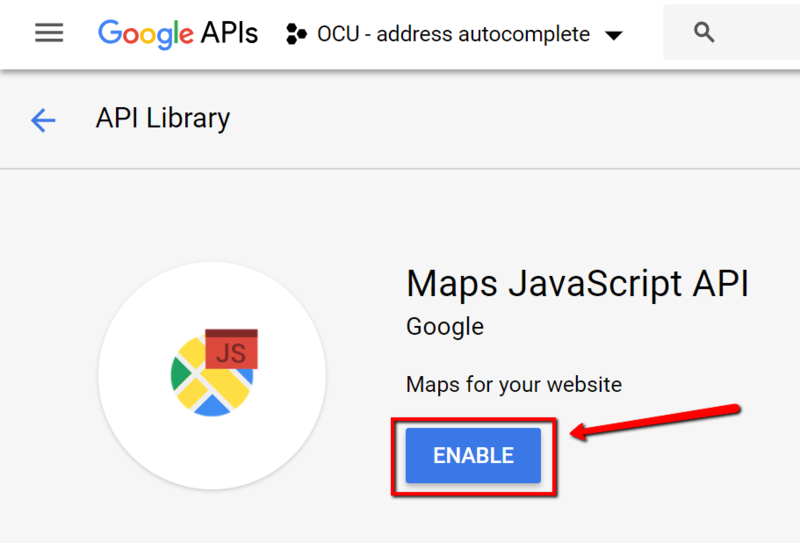 Simply follow the steps below to obtain your Google API Key to enable this on your store. Note: the Google Places API is a paid service and subject to Google's terms and conditions. Please see additional details at the end of this article. Google Address Autocomplete currently works for addresses for customers from the following countries: Australia, New Zealand, Canada, India, Japan, United States, Germany, Austria, Luxembourg, Belgium, Switzerland, France, Spain and Brazil. Note: You will need a Google account for this. 1. 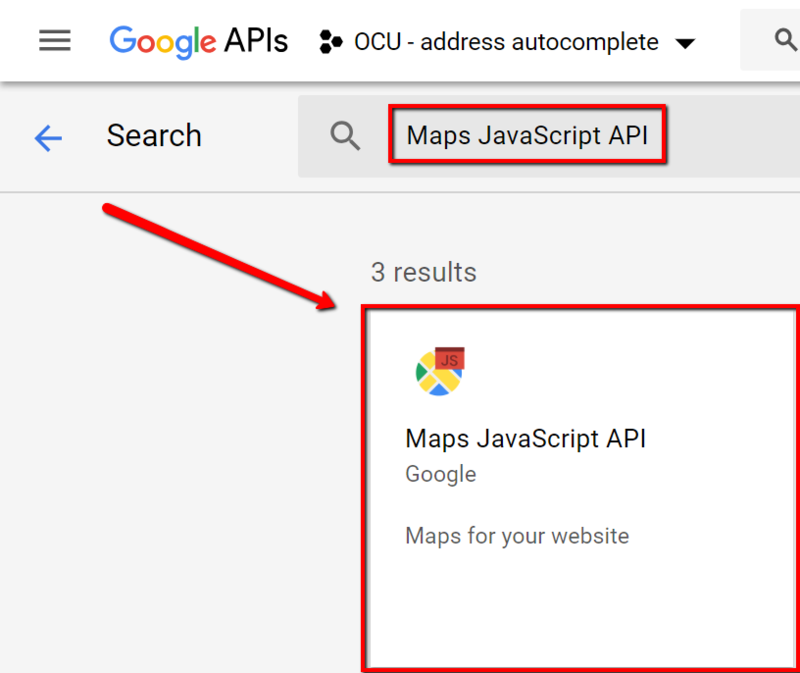 Go to the Google API Console by clicking here. 3. Name your new Project and then click the "Create" button. 4. From the Dashboard, click the "Enable APIs and Services" button. 5. 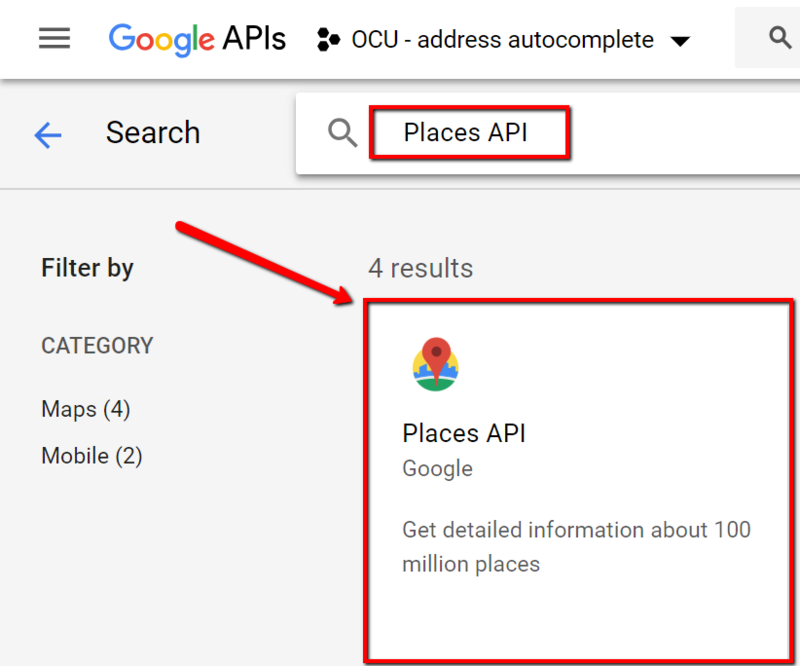 Search for "Places API" and select the Places API. 6. Click the "Enable" button for the Places API. 8. Click the "Enable" button. 9. Go to the "Dashboard" section in the left-side menu. There you will see the two APIs you just added. Select the "Places API" by clicking on it. 10. Click into the "Credentials" tab. Click the "Create credentials" button and select API key. 11. Copy your API key. This is the key to paste into the OCU app at Preferences > Checkout > Address Autocomplete. If you'd like to set restrictions, click into your API key. You can set restrictions by Application or API. Application restrictions specify which web sites, IP addresses, or apps can use this key, so we recommend to use this option. 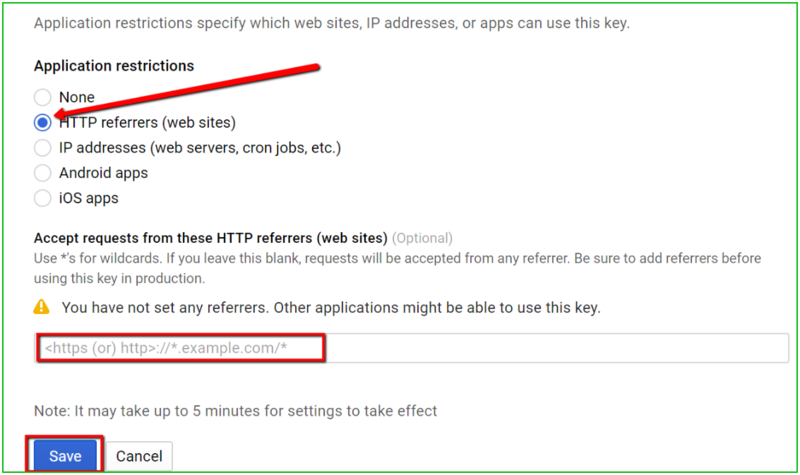 Select "Application restrictions" then HTTP referrers (web sites). Enter in your website's primary domain and click the "Save" button. 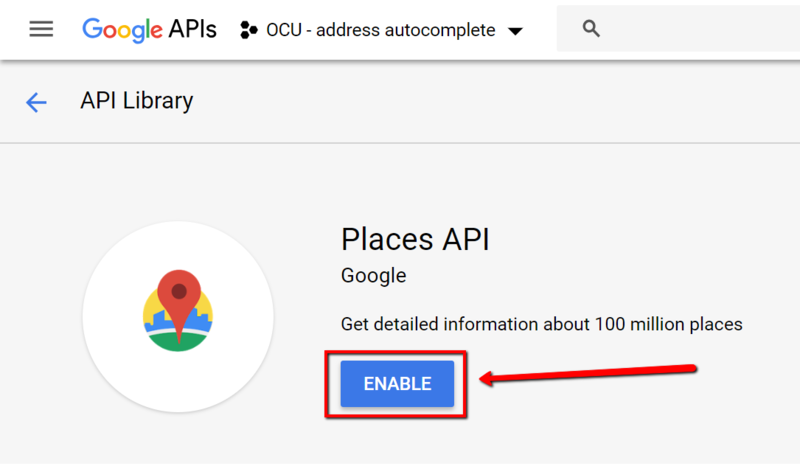 Important Note: Google Address Autocomplete for the OCU app uses your Google Places API created using the information described above. This is a paid service. Your monthly bill will change depending on how many checkouts are initiated on your store. Google recently updated its API pricing plans and took away previously imposed API limits (great for users with a high volume of API calls), but also changed the free 'credits' that were previously part of every plan to a new $200/month recurring credit. This change may impact the cost of your plan. While small stores may stay under the $200/month credit, some stores may incur charges. We recommend logging into your Google API account to understand what you are being charged. Review the API-specific Billing Changes and the guide to understanding billing. You can also estimate your monthly bill under the new pricing model with the pricing calculator.